Getting old isn’t nearly as bad as people think it will be. Nor is it quite as good. On aspects of everyday life ranging from mental acuity to physical dexterity to sexual activity to financial security, a new Pew Research Center Social & Demographic Trends survey on aging among a nationally representative sample of 2,969 adults finds a sizable gap between the expectations that young and middle-aged adults have about old age and the actual experiences reported by older Americans themselves. 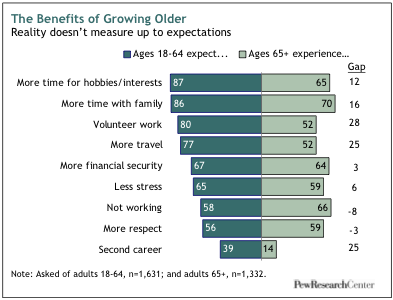 At the same time, however, older adults report experiencing fewer of the benefits of aging that younger adults expect to enjoy when they grow old, such as spending more time with their family, traveling more for pleasure, having more time for hobbies, doing volunteer work or starting a second career. These generation gaps in perception also extend to the most basic question of all about old age: When does it begin? 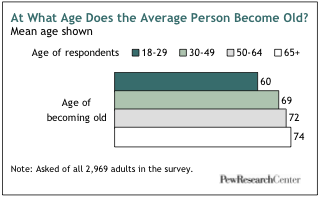 Survey respondents ages 18 to 29 believe that the average person becomes old at age 60. Middle-aged respondents put the threshold closer to 70, and respondents ages 65 and above say that the average person does not become old until turning 74. Other potential markers of old age–such as forgetfulness, retirement, becoming sexually inactive, experiencing bladder control problems, getting gray hair, having grandchildren–are the subjects of similar perceptual gaps. For example, nearly two-thirds of adults ages 18 to 29 believe that when someone “frequently forgets familiar names,” that person is old. Less than half of all adults ages 30 and older agree. However, a handful of potential markers–failing health, an inability to live independently, an inability to drive, difficulty with stairs–engender agreement across all generations about the degree to which they serve as an indicator of old age. The survey findings would seem to confirm the old saw that you’re never too old to feel young. In fact, it shows that the older people get, the younger they feel–relatively speaking. Among 18 to 29 year-olds, about half say they feel their age, while about quarter say they feel older than their age and another quarter say they feel younger. By contrast, among adults 65 and older, fully 60% say they feel younger than their age, compared with 32% who say they feel exactly their age and just 3% who say they feel older than their age. In sync with this upbeat way of counting their felt age, older adults also have a count-my-blessings attitude when asked to look back over the full arc of their lives. Nearly half (45%) of adults ages 75 and older say their life has turned out better than they expected, while just 5% say it has turned out worse (the remainder say things have turned out the way they expected or have no opinion). All other age groups also tilt positive, but considerably less so, when asked to assess their lives so far against their own expectations. To be sure, there are burdens that come with old age. About one-in-four adults ages 65 and older report experiencing memory loss. About one-in-five say they have a serious illness, are not sexually active, or often feel sad or depressed. About one-in-six report they are lonely or have trouble paying bills. One-in-seven cannot drive. One-in-ten say they feel they aren’t needed or are a burden to others. But when it comes to these and other potential problems related to old age, the share of younger and middle-aged adults who report expecting to encounter them is much higher than the share of older adults who report actually experiencing them. Moreover, these problems are not equally shared by all groups of older adults. Those with low incomes are more likely than those with high incomes to face these challenges. The only exception to this pattern has to do with sexual inactivity; the likelihood of older adults reporting a problem in this realm of life is not correlated with income. Not surprisingly, troubles associated with aging accelerate as adults advance into their 80s and beyond. 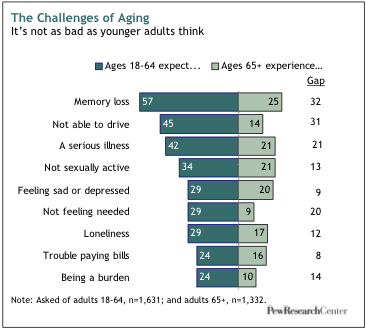 For example, about four-in-ten respondents (41%) ages 85 and older say they are experiencing some memory loss, compared with 27% of those ages 75-84 and 20% of those ages 65-74. Similarly, 30% of those ages 85 and older say they often feel sad or depressed, compared with less than 20% of those who are 65-84. And a quarter of adults ages 85 and older say they no longer drive, compared with 17% of those ages 75-84 and 10% of those who are 65-74. But even in the face of these challenges, the vast majority of the “old old” in our survey appear to have made peace with their circumstances. Only a miniscule share of adults ages 85 and older–1%–say their lives have turned out worse than they expected. It no doubt helps that adults in their late 80s are as likely as those in their 60s and 70s to say that they are experiencing many of the good things associated with aging–be it time with family, less stress, more respect or more financial security. When asked about a wide range of potential benefits of old age, seven-in-ten respondents ages 65 and older say they are enjoying more time with their family. About two-thirds cite more time for hobbies, more financial security and not having to work. About six-in-ten say they get more respect and feel less stress than when they were younger. Just over half cite more time to travel and to do volunteer work. 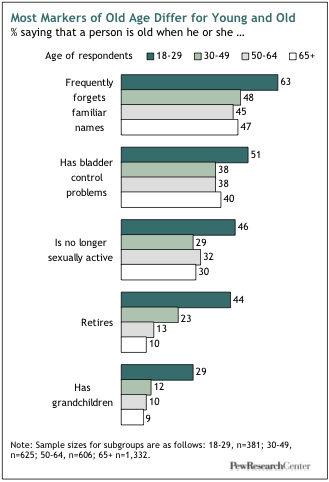 As the nearby chart illustrates, older adults may not be experiencing these “upsides” at quite the prevalence levels that most younger adults expect to enjoy them once they grow old, but their responses nonetheless indicate that the phrase “golden years” is something more than a syrupy greeting card sentiment. Of all the good things about getting old, the best by far, according to older adults, is being able to spend more time with family members. In response to an open-ended question, 28% of those ages 65 and older say that what they value most about being older is the chance to spend more time with family, and an additional 25% say that above all, they value time with their grandchildren. A distant third on this list is having more financial security, which was cited by 14% of older adults as what they value most about getting older. These survey findings come at a time when older adults account for record shares of the populations of the United States and most developed countries. Some 39 million Americans, or 13% of the U.S. population, are 65 and older–up from 4% in 1900. The century-long expansion in the share of the world’s population that is 65 and older is the product of dramatic advances in medical science and public health as well as steep declines in fertility rates. In this country, the increase has leveled off since 1990, but it will start rising again when the first wave of the nation’s 76 million baby boomers turn 65 in 2011. By 2050, according to Pew Research projections, about one-in-five Americans will be over age 65, and about 5% will be ages 85 and older, up from 2% now. These ratios will put the U.S. at mid-century roughly where Japan, Italy and Germany–the three “oldest” large countries in the world–are today. We assume that the older adults we were unable to reach for these reasons have a lower quality of life, on average, than those we did reach. To mitigate this problem, the survey included interviews with more than 800 adults whose parents are ages 65 or older. We asked these adult children many of the same questions about their parents’ lives that we asked of older adults about their own lives. These “surrogate” respondents provide a window on the experiences of the full population of older adults, including those we could not reach directly. Not surprisingly, the portrait of old age they draw is somewhat more negative than the one painted by older adult respondents themselves. We present a summary of these second-hand observations at the end of Section I in the belief that the two perspectives complement one another and add texture to our report. The Generation Gap, Circa 2009. In a 1969 Gallup Poll, 74% of respondents said there was a generation gap, with the phrase defined in the survey question as “a major difference in the point of view of younger people and older people today.” When the same question was asked a decade later, in 1979, by CBS and The New York Times, just 60% perceived a generation gap. But in perhaps the single most intriguing finding in this new Pew Research survey, the share that say there is a generation gap has spiked to 79%–despite the fact that there have been few overt generational conflicts in recent times of the sort that roiled the 1960s. It could be that the phrase now means something different, and less confrontational, than it did at the height of the counterculture’s defiant challenges to the establishment 40 years ago. Whatever the current understanding of the term “generation gap,” roughly equal shares of young, middle-aged and older respondents in the new survey agree that such a gap exists. The most common explanation offered by respondents of all ages has to do with differences in morality, values and work ethic. Relatively few cite differences in political outlook or in uses of technology. When Does Old Age Begin? At 68. That’s the average of all answers from the 2,969 survey respondents. But as noted above, this average masks a wide, age-driven variance in responses. 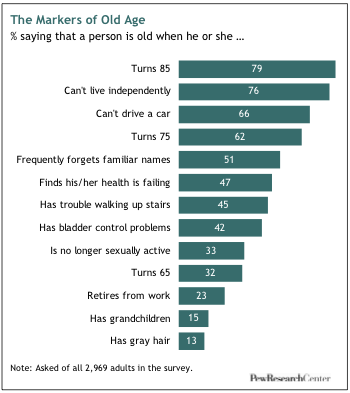 More than half of adults under 30 say the average person becomes old even before turning 60. Just 6% of adults who are 65 or older agree. Moreover, gender as well as age influences attitudes on this subject. Women, on average, say a person becomes old at age 70. Men, on average, put the number at 66. In addition, on all 10 of the non-chronological potential markers of old age tested in this survey, men are more inclined than women to say the marker is a proxy for old age. Are You Old? Certainly not! Public opinion in the aggregate may decree that the average person becomes old at age 68, but you won’t get too far trying to convince people that age that the threshold applies to them. 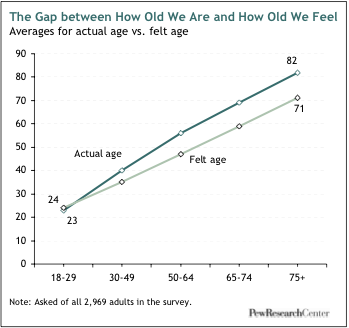 Among respondents ages 65-74, just 21% say they feel old. Even among those who are 75 and older, just 35% say they feel old. What Age Would You Like to Live To? The average response from our survey respondents is 89. One-in-five would like to live into their 90s, and 8% say they’d like to surpass the century mark. The public’s verdict on the most desirable life span appears to have ratcheted down a bit in recent years. A 2002 AARP survey found that the average desired life span was 92. 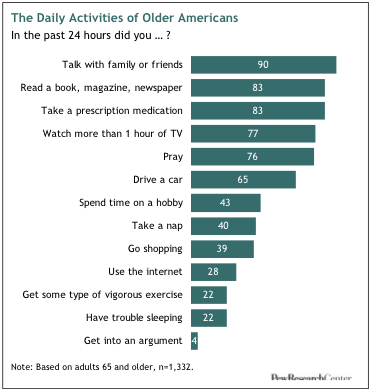 What Do Older People Do Every Day? Among all adults ages 65 and older, nine-in-ten talk with family or friends every day. About eight-in-ten read a book, newspaper or magazine, and the same share takes a prescription drug daily. Three-quarters watch more than a hour of television; about the same share prays daily. Nearly two-thirds drive a car. Less than half spend time on a hobby. About four-in-ten take a nap; about the same share goes shopping. Roughly one-in-four use the internet, get vigorous exercise or have trouble sleeping. Just 4% get into an argument with someone. As adults move deeper into their 70s and 80s, daily activity levels diminish on most fronts–especially when it comes to exercising and driving. On the other hand, daily prayer and daily medication both increase with age. 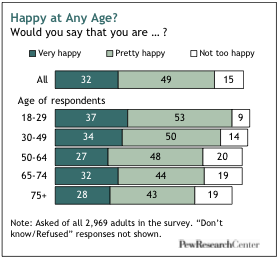 Are Older Adults Happy? They’re about as happy as everyone else. And perhaps more importantly, the same factors that predict happiness among younger adults–good health, good friends and financial security–by and large predict happiness among older adults. However, there are a few age-related differences in life’s happiness sweepstakes. Most notably, once all other key demographic variables are held constant, being married is a predictor of happiness among younger adults but not among older adults (perhaps because a significant share of the latter group is made up of widows or widowers, many of whom presumably have “banked” some of the key marriage-related correlates of happiness, such as financial security and a strong family life). Among all older adults, happiness varies very little by age, gender or race. Retirement and Old Age. Retirement is a place without clear borders. Fully 83% of adults ages 65 and older describe themselves as retired, but the word means different things to different people. Just three-quarters of adults (76%) 65 and older fit the classic stereotype of the retiree who has completely left the working world behind. An additional 8% say they are retired but are working part time, while 2% say they are retired but working full time and 3% say they are retired but looking for work. The remaining 11% of the 65-and-older population describe themselves as still in the labor force, though not all of them have jobs. Whatever the fuzziness around these definitions, one trend is crystal clear from government data3: After falling steadily for decades, the labor force participate rate of older adults began to trend back upward about 10 years ago. In the Pew Research survey, the average retiree is 75 years old and retired at age 62.
r own home or apartment, and the vast majority are either very satisfied (67%) or somewhat satisfied (21%) with their living arrangements. However, many living patterns change as adults advance into older age. 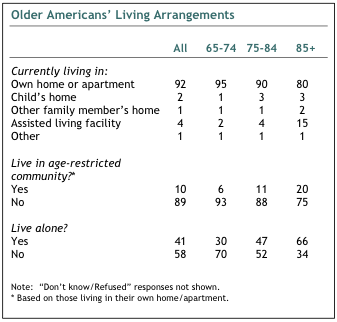 For example, just 30% of adults ages 65-74 say they live alone, compared with 66% of adults ages 85 and above. Also, just 2% of adults ages 65-74 and 4% of adults ages 75-84 say they live in an assisted living facility, compared with 15% of those ages 85 and above. Old-School Social Networking. The great majority of adults ages 65 and older (81%) say they have people around them, other than family, on whom they can rely on for social activities and companionship. About three-quarters say they have someone they can talk to when they have a personal problem; six-in-ten say they have someone they can turn to for help with errands, appointments and other daily activities. On the flip side of the coin, three-in-ten older adults say they “often” help out other older adults who are in need of assistance, and an additional 35% say they sometimes do this. Most of these social connections remain intact as older adults continue to age, but among those 85 and above, the share that say they often or sometimes provide assistance to others drops to 44%. The Twitter Revolution Hasn’t Landed Here. If there’s one realm of modern life where old and young behave very differently, it’s in the adoption of newfangled information technologies. Just four-in-ten adults ages 65-74 use the internet on a daily basis, and that share drops to just one-in-six among adults 75 and above. By contrast, three-quarters of adults ages 18-30 go online daily. 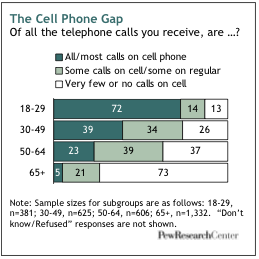 The generation gap is even wider when it comes to cell phones and text messages. Among adults 65 and older, just 5% get most or all of their calls on a cell phone, and just 11% sometimes use their cell phone to send or receive a text message. For adults under age 30, the comparable figures are 72% and 87%, respectively. Religion and Old Age. 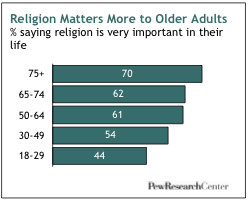 Religion is a far bigger part of the lives of older adults than younger adults. Two-thirds of adults ages 65 and older say religion is very important to them, compared with just over half of those ages 30 to 49 and just 44% of those ages 18 to 29. Moreover, among adults ages 65 and above, a third (34%) say religion has grown more important to them over the course of their lives, while just 4% say it has become less important and the majority (60%) say it has stayed the same. Among those who are over 65 and report having an illness or feeling sad, the share who say that religion has become more important to them rises to 43%. Staying in Touch with the Kids. Nearly nine-in-ten adults (87%) ages 65 and older have children. Of this group, just over half are in contact with a son or daughter every day, and an additional 40% are in contact with at least one child–either in person, by phone or by email–at least once a week. Mothers and daughters are in the most frequent contact; fathers and daughters the least. Sons fall in the middle, and they keep in touch with older mothers and fathers at equal rates. Overall, three-quarters of adults who have a parent or parents ages 65 and older say they are very satisfied with their relationship with their parent(s), but that share falls to 62% if a parent needs help caring for his or her needs. Was the Great Bard Mistaken? Shakespeare wrote that the last of the “seven ages of man” is a second childhood. Through the centuries, other poets and philosophers have observed that parents and children often reverse roles as parents grow older. Not so, says the Pew Research survey. Just 12% of parents ages 65 and older say they generally rely on their children more than their children rely on them. 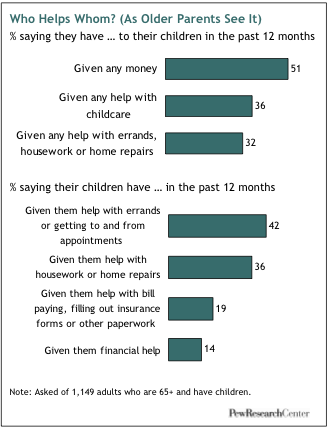 An additional 14% say their children rely more on them. The majority–58%–says neither relies on the other, and 13% say they rely on one another equally. Responses to this question from children of older parents are broadly similar. Intergenerational Transfers within Families. Despite these reported patterns of non-reliance, older parents and their adult children do help each other out in a variety of ways. However, the perspectives on these transfers of money and time differ by generation. For example, about half (51%) of parents ages 65 and older say they have given their children money in the past year, while just 14% say their children have given them money. The intra-family accounting comes out quite differently from the perspective of adult children. Among survey respondents who have a parent or parents ages 65 or older, a quarter say they received money from a parent in the past year, while an almost equal share (21%) say they gave money to their parent(s). There are similar difference in perception, by generation, about who helps whom with errands and other daily activities. (To be clear, the survey did not interview specific pairs of parents and children; rather, it contacted random samples who fell into these and other demographic categories.) Not surprisingly, as parents advance deeper into old age, both they and the adult children who have such parents report that the balance of assistance tilts more toward children helping parents. Conversations about End-of-Life Matters. More than three-quarters of adults ages 65 and older say they’ve talked with their children about their wills; nearly two-thirds say they’ve talked about what to do if they can no longer make their own medical decisions, and more than half say they’ve talked with their children about what to do if they can no longer live independently. Similar shares of adult children of older parents report having had these conversations. 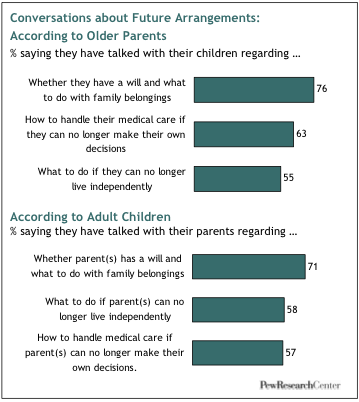 Parents and adult children agree that it is the parents who generally initiate these conversations, though 70% of older adults report that this is the case, compared with just 52% of children of older parents who say the same. nics were obtained. The black and Hispanic oversamples were achieved by oversampling landline exchanges with more black and Hispanic residents as well as callbacks to blacks and Hispanics interviewed in previous surveys. A total of 2,417 interviews were completed with respondents contacted by landline telephone and 552 with those contacted on their cellular phone. The data are weighted to produce a final sample that is representative of the general population of adults in the continental United States. Survey interviews were conducted under the direction of Princeton Survey Research Associates (PSRA). Interviews were conducted Feb. 23-March 23, 2009. There were 2,969 interviews, including 1,332 with respondents 65 or older. The older respondents included 799 whites, 293 blacks and 161 Hispanics. For data reported by race or ethnicity, the margin of sampling error is plus or minus 3.5 percentage points for the sample of older whites, plus or minus 7.4 percentage points for older blacks and plus or minus 10.3 percentage points for older Hispanics. Note on terminology: Whites include only non-Hispanic whites. Blacks include only non-Hispanic blacks. Hispanics are of any race. With the assistance of PSRA, the Pew Research Center conducted four focus groups earlier this year in Baltimore, Md. Two groups were made up of adults ages 65 and older; two others were made up of adults with parents ages 65 and older. Our purpose was to listen to ordinary Americans talk about the challenges and pleasures of growing old, and the stories we heard during those focus groups helped us shape our survey questionnaire. Focus group participants were told that they might be quoted in this report, but we promised not to quote them by name. The quotations interspersed throughout these pages are drawn from these focus group conversations. This report was edited and the overview written by Paul Taylor, executive vice president of the Pew Research Center and director of its Social & Demographic Trends project. Sections I, II and III were written by Senior Researcher Kim Parker. Section IV was written by Research Associate Wendy Wang and Taylor. Section V was written by Senior Editor Richard Morin. The Demographics Section was written by Senior Writer D’Vera Cohn and the data was compiled by Wang. Led by Ms. Parker, the full Social & Demographic Trends staff wrote the survey questionnaire and conducted the analysis of its findings. The regression analysis we used to examine the predictors of happiness among older and younger adults was done by a consultant, Cary L. Funk, associate professor in the Wilder School of Government at Virginia Commonwealth University. The report was copy-edited by Marcia Kramer of Kramer Editing Services. It was number checked by Pew Research Center staff members Ana Gonzalez-Barrera, Daniel Dockterman and Cristina Mercado. We wish to thank other PRC colleagues who offered research and editorial guidance, including Andrew Kohut, Scott Keeter, Gretchen Livingston, Jeffrey Passel, Rakesh Kochhar and Richard Fry.